- PDF are the expendable grunts (and they can't become Space Marines, they are grown men, not young candidates) -> PDF soldiers are HWPs you can buy for cheap. That makes their life suitably cheap and meaningless but that also makes them good fodder in the early game to preserve your scouts (so they can improve and become real space marines). - The story starts on a world with a chapter keep, doing recruitment: You only have recruits as your soldiers (since that's how the game is). You yourself are the castellan of the keep and will not take part in fights, your duty is to defend the keep. That explains why you start with soldiers in scout armor. - You get your recruits in the shop, as usual, for whichever currency you decide to use (I'm thinking "Astartes Influence", space marines don't use money), you can also buy basic weapons (bolt pistol, chainsword, combat blades, bolters, flamers, heavy bolter, missile launcher) and their ammo there. Maybe some crafts and tanks too, but those are difficult to implement properly. - Power armor is the equivalent of XCom power suits: It is really strong armor. It also increases strength a decent amount (So you can carry lascannons, power fists, plasma cannons, etc, which are really heavy so that scouts can't use them), increase reactions a bit (combat feed in the helmet) and stamina a LOT. - BUT Power armor also decreases your firing by 20 and melee accuracy by 10. That represents the fact that new recruits can't immediately be put in power armour, they need to train first otherwise they'd be useless. Terminator armor (if you ever make it) decreases melee by 40 and firing by 30. You have to be an amazing warrior to be able to fight in terminator armor. Space Marines veterans have to train in order to be granted terminator honours. So you get a recruit with ~55 accuracy, train him to ~65 accuracy, now he's worthy of power armor. In power armor, you're back at 50 accuracy. So you can grab a heavy weapon that has good aim shot accuracy (say.. 150%, so that brings you up to a good chance to hit) or intense firing rate (heavy bolter) or area of effects (plasma cannon or frag missile; krak missile is a high power, small radius missile you need to aim). Otherwise you don't hit much. So the main roles for your new marine is: Devastator marine! (which is indeed the first role of newly inducted full brothers in power armor according to the new background). But you don't have that many heavy weapons, so a few have to have bolters (and take ~120% aim shots from a distance). Soldiers keep improving their stats and now it's not a bad choice to swing a chainsword, since they're tough and fast (Health and TUs from secondary gain from killing all the stuff with that heavy-bolter/missile-launcher/lascannon). They're now an assault marine, which is indeed the 2nd role of new marines. And after a lot of practice, they are ready for auto-fire with a bolter, you are now a worthy tactical marine of the battle companies, ready to breach UFOs and blow up Xeno scum. Keep improving, they'll become a worthy vet (strong enough to wield a power sword/fist!) and eventually be good enough for terminator armor, where you will start with destroying everything with your storm bolter/assault cannon and use that power fist occasionally up close. Keep punching stuff (or remain an assault marine, ie vanguard veteran) and eventually you're ready for the real cc-weapons: lightning claws and thunder hammer. (Ideally you can make sprites and graphics for a storm shield too, and we will have to trust the player not to abuse this by putting something in the shield hamd). Combat blade: Fast flat TU cost, low damage. Heavy Bolter: Fast rate of fire plus exploding shell means anybody can use it and kill stuff. Heavy, only strong people can carry it around. Bolter: autoshots with exploding shells, pretty accurate aimed shot. Kind of an auto-cannon with HE ammo. Missile-Launcher: You need to aim to hit with krak missiles but the damage is worth it. Frag missiles have a big blast but lower damage. Heavy if you want lots of missiles. Power sword: More difficult to hit with, better damage. Some damage ignores armor. Meltagun: low rate of fire, insane damage. Lascannon: can only be aimed, but with good accuracy and oh the damage..! Power fist: Medium accuracy, HEAVY and slow fixed TU cost. Mean damage that mostly ignores armor. Power claw: Medium accuracy, HEAVY and fast TU cost. Medium damage that ignores some armor. Plasma pistol: Harder to aim, slower to fire (nobody wants overheats), great damage. Plasma guns: medium rate of fire, great damage. Plasma Cannon: can only be aimed, but it gives you great damage in an area. Thunder Hammer: Power fist that takes out some stamina/TU as well and applies some stun damage. Chainfist: Power fist that ignores all armor. Assault Cannon: Heavy bolter on steroid, so heavy you need terminator armor to carry it. Relic Blades: 2H Power sword with more damage, much heavier. Now I feel like I should get working on a ruleset..! I wonder if we could have more chapters to choose from via sub-mods? I'm thinking a set of separate sub-mods for various chapters that would change the graphics (mostly armour colouration) and perhaps minor stat changes. For example ultramarines could have better morale (For The Shall Know no Fear), Space Wolves would have better melee, etc., plus many chapters would have their own equipment variants (Salamanders have better flamers, Blood Angels have early hovertanks, etc.). The reason is to increase replayability, but also because various players have very specific preferences when it comes to chapters. For example I wouldn't be very interested with playing as Ultramarines, I'd much prefer Salamanders or maybe Space Wolves, cheesy as they might be. I know this means much more graphics, but I think it would be enough in most cases to simply change the colours automatically (via Falko's tool), with no real drawing. Or directly in game, you can recolor up to 4 colors (if you abuse face & hair & rank recoloring, if not then only 1 color for armor). No worries, I was actually offering to do some rules work if you're interested Once you get scout armor done, with your permission, I'll look into writing something, maybe with Ork mutons as the enemy? Or MechTau-ids. The PDF could easily be just the combat armor sprite with a rifle (with maybe more expensive versions for flamer and grenade launcher). I think the RP way is interesting, except it's just a RP way, not a cohesive, balanced environment. With the stats impact of armor, you actually have an incentive to put rookies in scout armor, veterans in power armors and only great soldiers in kickass armor. You can similarly have a weight/accuracy + resources balance aspect to the fancier gear so that it makes sense to have a variety of weapons. Anyhow, interesting work! I'll keep watching! And the idea of downsizing is cool too! Next a 2x2 baneblade! Just drifting through to check up on your mod. Read through the post, and was wondering something. Can you leave the SM as the true infantry but alter their price? So instead of 40k to recruit them, you need...500k? For a SM recruit that might be cheap. 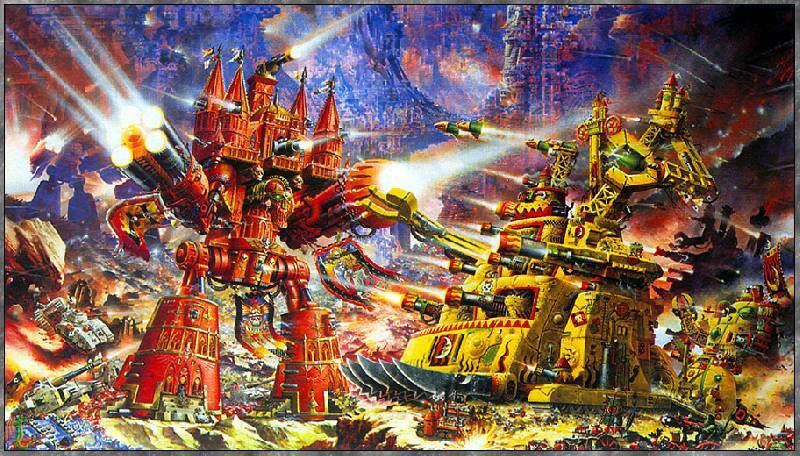 Then you can follow Arthanor's idea of using 'cheap' 40k HWP PDF/IG to supplement them. IG seems a better idea to me, but work is foreign to me. This way you can start the game with a squad of 'scouts', but call on the support of the local PDF/IG to help support you in your mission. Changing the price is trivial, but unfortunately the game doesn't support multiple types of troops. So either you get all Space Marines or no Space Marines. Following Dioxine's method in Piratez; you can make the cannonfodder IG as buyable "tanks"/"HWPs" like the Mercenaries, Alliance Advisors, etc. So you could, in a sense, hire fodder troops before missions... the only issue would be to A: keep a retinue in "stock" or B: somehow adjust the transfer time from Purchase screen. Didn't say it very clearly. Other infantry would be the HEAVY WEAPONS PLATFORM (Tanks?). Wouldn't be able to get them to gain experience, true, but IG (What I will use) are fairly stratified already. As you are not training the IG, but borrowing them from the local garrison. You can Role Play up a pretty good reason as to why they don't level up. IE the local Garrison was willing to loan you 50 conscripts to aid you, not 48 conscripts and 2 veterans. As they become experienced (And therefore more valuable to the garrison) they are rotated out with replacements. The very nature of the split organizational structure would also justify why they don't have names and personality. The IG troops are not YOUR men, but are assigned to help temporarily. Ah yes, that is perfectly possible. I can imagine some really high HWP limits on your ships. And speaking of HWPs, I don't think anyone mentioned Dreadnoughts! No ninja; just great minds think alike. Good expansion. Also to Scorch, I believe Dioxine set up transports for certain HWPs to act as soldiers; or at least appears to me during gameplay.